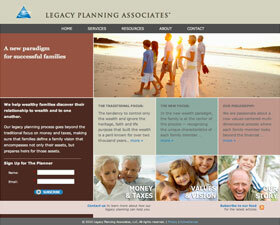 Legacy Planning Associates are a team of family wealth advisors that help high net worth families place family values at the center of their wealth planning to ensure successful business and wealth transition. The challenge given ActiveCanvas was to develop a method of telling the Legacy Planning story and defining the services in a style and language that rings true to the company’s core mission. The solution was a ‘storybook’ format that begins with traditional money and taxes management and a video about how most family wealth won’t survive past the third generation. The story turns the page to the new focus on legacy planning based on values and vision. Then, because advisors are chosen based on who they are, not what they do, the story continues by retelling the life event story that catapulted each partner to choose the human side of family legacy planning. Storytelling continues to drive content in the Services section where a successful family’s experience is told as a Case Study. Additional site features include a Reading Room where recommended books can be purchased, select articles, and video. Because each of the three partners work from different locations, the Contact page is actually three distinct bios, also in storybook format.